The Borough of Chambersburg is committed to transparency in Local Government. Transparent governance means that government officials act openly, with citizens’ knowledge of the decisions the officials are making. Availability of information on government policies and actions, a clear sense of organizational responsibility, and an assurance that governments are efficiently administered and free of systemic waste are important components of transparent governance. Finally, we are committed to providing the public with as much information as possible. We are proud of our efforts, especially in comparison to other Pennsylvania municipalities. The enclosed information is provided to better inform the public, but citizens have a responsibility to seek out the information. Some of our systems require citizens to search, using various websites, and applications, for the information that they seek. If you have any questions on how these sources of information operate, please contact the Borough Secretary at (717) 261-3254 during regular business hours. Board Docs is organized by Council meeting date. Pick the date and browse through the different items on that agenda. The next future meeting is posted with general descriptions before the meeting happens and then updated with details after the meeting occurs. Board Docs also has a search engine for action items or documents. Adopted Local Laws and Town Council, Planning & Zoning and other meeting Minutes: Chambersburg maintains an online database of all official local laws and minutes of all meetings (the official record) through a searchable database maintained by eCode360. 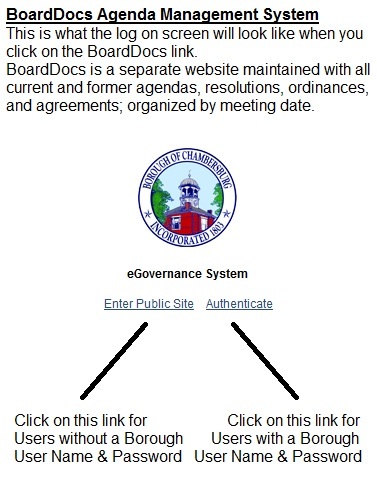 eCode360 also has a search engine for both local laws and references in the official record. Reports, Policies, Budgets, Audits and All Other Documents: Chambersburg provides the public with web based access to as many other important and detailed documents of the Borough below as possible including Frequently Asked Questions about the Borough Budget, our Comprehensive Planning Documents, which establish development goals, and Sealed Bids & Proposals for Borough projects. Your time reading these documents will provide you with a complex and comprehensive understanding of the Borough and our finances. Right to Know Act Compliance: If you have any questions or require any information on any issue or action of the Borough of Chambersburg, pursuant to the Pennsylvania Right to Know (RTK) Act, please feel free to complete and transmit the enclosed form. Government Official Accessibility: The Borough of Chambersburg is a fully accessible local government. Please click on the Staff Directory page to get phone and 24/7 email access to the key personnel of the Borough. When in doubt, call the Borough's 24/7 Customer Service Center at (717) 263-4111 or the Borough Secretary's Office during business hours at (717) 261-3254 with any questions.